Surround yourself by those you love and create a one of a kind family portrait necklace. 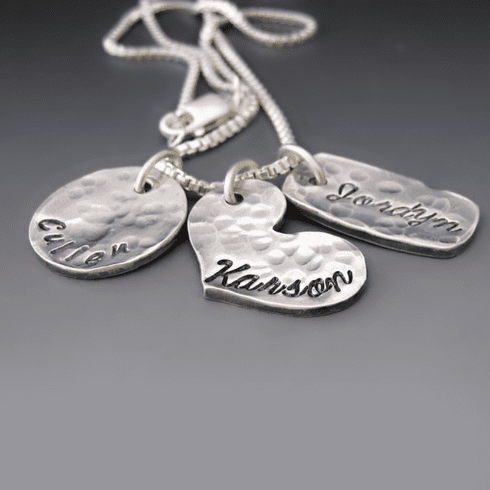 Mix and match to choose pendant styles and fonts that match the personalities of those who matter most in your life. Add names, anniversary dates, birth dates or inspirational words. Each pendant is hand molded and fired in a kiln in my studio. It is washed with a light patina and tumble polished to give it dimension. Slight variations will occur from pendant to pendant. These differences should not been seen as defects, but rather adding to the charm and uniqueness of each piece. The hand cast process makes each charm as one of a kind as the person who wears it. The pendants are made of eco friendly recycled sterling silver. This necklace is considered a PERSONALIZED ITEM. It is a final sale and cannot be returned or exchange.